After a fabulous Thanksgiving long weekend we are back to school lunches. Be sure to follow Twin Dragonfly Designs on Facebook or Instagram for many, many more bento lunch box ideas posted almost daily. No joke! 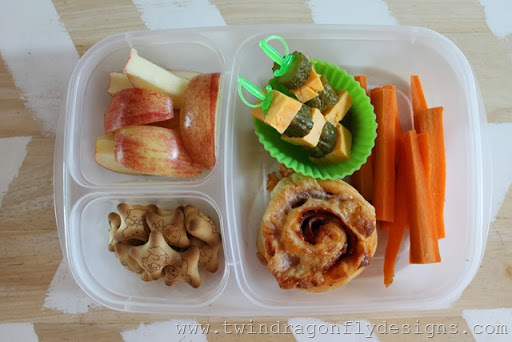 These lunch boxes from Easy Lunch Boxes are my absolute favorite! I am working on hosting a giveaway for these on the blog because I just know that you all would love them! Everything seems to fit perfectly with just the right amount of divided space. Here the boys had a pizza bun, carrots, cheese, pickles, apples and teddy cookies. Sword skewers are from Walmart and the silicone cup from Wholeport. 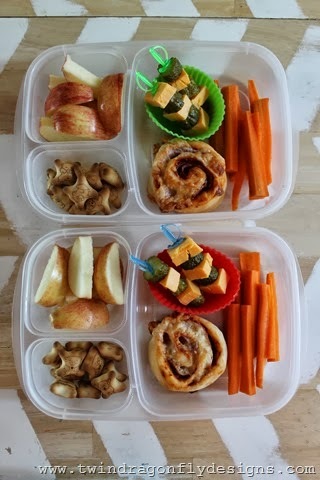 Do you have any go to bento boxes? I just love these lunch boxes from Easy Lunch Boxes! I need to get some!